There are many options for you to consider when you are looking to save money on your phone bill or when you just want something different. In fact BestMVNO.com now tracks over 60 of these providers. In order to come up with a list of what I think are the 10 best and most unique provider offerings around, I had to first sort through this MVNO list and think about what makes each one unique and possibly a good value for the consumer. Factors like what the customer support experience is like were not factored into choosing providers. If you are already on a no contract cell phone plan and are unhappy with your current provider, or if you have a device installment plan that is close to being paid off with a major wireless carrier, you may find any of the following plans to be a good fit for your needs. Without further ado, here is this years list that is in no particular order. FreedomPop offers completely free cell phone plans that are available on two different networks which together make this MVNO unique. By offering free plans, FreedomPop can provide consumers with tremendous value as long as they are willing to put up with a few potential caveats. The two networks that FreedomPop uses to provide service are AT&T and Sprint. When consumers elect to subscribe to FreedomPop’s free Sprint based plan they’ll get 200 minutes, 500 texts and 500 MB of data to use every month at no cost. The AT&T based plan gets consumers better coverage and 200 minutes, 200 MB of data and 500 texts to use every month. Yes, the aforementioned plans are completely free. You don’t have to pay one cent for your cell phone plan if you don’t want to. FreedomPop’s free cell phone plan does not include voicemail. Voicemail costs extra and is priced at $2.49/month or $7.99/month if you want FreedomPop’s Premium Plus Package which brings us to the next gotcha. FreedomPop’s voice service does not go over a traditional cellular network but rather over a VoIP network. What this means is that your phone calls get routed over a data network which can either be Wi-Fi or your phone’s cellular data connection. For some people this can cause problems such as voice latency, where one speaks but it take a split second longer than normal for the person on the other end to hear what was said. Sometimes this leads to people talking over one another which can be a frustrating experience. This isn’t something that everyone notices though and whether or not you will notice may depend on which network you are using and where you live. This is exactly the same way that Google Voice/Hangouts works. For me the experience has always been good with Google Voice no matter if I’m on Wi-Fi or a cellular network, but for others it does cause a problem. FreedomPop’s Premium Plus package can help get around this latency issue. Aside from providing users with voicemail, it also gives them access to traditional cellular networks for phone calls as well as data rollover and MMS picture messaging. 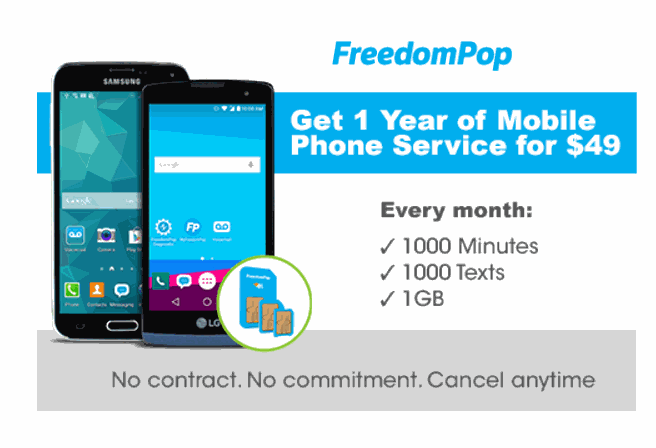 FreedomPop’s free cell phone plans do not include MMS picture messaging. Another catch is that the free plan using the Sprint network has data speeds limited to 1 Mbps. Subscribers have to pay $5/month for faster speeds. One final catch is that FreedomPop requires its users to place at least one phone call every 60 days to avoid having their account deactivated. This is a recently policy change that was put in place by the company as a lot of people are able to work around FreedomPop’s gotchas by simply using Google Voice/Hangouts. By using Google Voice with a free plan, subscribers can get voicemail and MMS picture messaging without having to pay extra money for it like FreedomPop would like you to do so. Voice minutes and text messages are also unlimited this way as long as you are using a Wi-Fi connection, otherwise they do deduct from your monthly data allotment. So after all of that, is FreedomPop’s free plan a good deal? It could be, but it may depend on how you like to use your phone. One thing that is for sure, is that the company is definitely unique. Aside from offering free phone plans, FreedomPop does offer paid plans with more data and unlimited talk and text that are also really cheap as well. The same type of caveats generally do apply. A selection of cheap cell phones are also available but you can bring your own if you’d like. For more on FreedomPop and those plans, see everything you need to know about FreedomPop. What makes Ting Mobile unique is that they were the first MVNO to provide a la carte pricing. Originally operating on the Sprint network and now T-Mobile as well, they offer texts, minutes, and data in the form of buckets that come in various sizes. You can mix and match buckets for each service to put together the plan that best suite your needs. You can even exclude service features if you'd like. Ting also lets its subscribers combine their T-Mobile and Sprint devices on a single plan, something that's rare in the field. Whatever combination of features you choose to put together you will have a $6 service fee (per device network access charge) tacked on to the plans cost. A summary of Ting's plans can be found in the info graphic below as shown on Ting's website. Although Ting’s phone plans are certainly not the cheapest around, the company is also known for having great customer support which is something a lot of people value. If you like the idea of Ting but are more interested in cheaper service US Mobile, Tello, or even Twigby may be a better choice for you. Republic Wireless offers prepaid wireless plans starting at $15/month for unlimited talk and text with no data, and plans that include data start at $20/month for 1 GB. 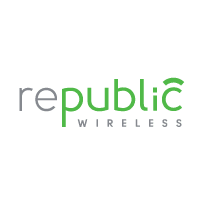 What separates Republic Wireless from the rest is that they are a wi-fi first based operation that offers hybrid calling. When you subscribe to Republic Wireless all of your calls and texts will be routed over wi-fi whenever possible, and when wi-fi is unavailable your calls will fallback to using a cellular network, and that network is either Sprint or T-Mobile depending on which network you elected to sign up with. Other MVNO’s also offer wi-fi calling and texting, but with Republic things are a little bit different than most as everything is done seamlessly. There are no special user interactions needed on the end users part to place calls via wi-fi or the cellular network, it is all done automatically. Google’s Project Fi also works this way, and can be considered a good alternative to Republic Wireless although Fi offers a smaller phone selection. Although Republic Wireless’s phone selection is bigger than Project Fi’s, overall the selection is smaller than what other brands offer. Unlike when the MVNO last made it into this list, Republic Wireless does at least now offer support for bring your own device. In order to bring your own device to Republic, it must be one that the company is currently selling. Republic Wireless sells nearly all Motorola devices and they include the Motorola E4, E4 Plus, and G5 Plus to name a few. The Samsung Galaxy S7 Edge is also sold and supported as is a device from Huawei. Moving forward, future Motorola devices should also be supported as should the main line of Samsung Galaxy devices. iPhones however are not supported. Started by John Paul Dejoria, CEO of Paul Mitchell, this MVNO offers phone plans that operate on either the Sprint, Verizon or AT&T networks. In the past ROK Mobile made it into this list by offering a phone plan that also included a subscription to a music streaming service with a library of over 20 million songs. ROK Mobile, at least at the moment, no longer offers such a service. The company does however offer features that no other provider offers and they may even be perceived as being a bit strange by some. All of ROK Mobile’s plans include 24/7/365 roadside assistance. Some of their other plans also include or have available as add ons things such as accidental death insurance, ID theft insurance and burial and cremation service to name a few. Even with the extra features and add ons available, ROK Mobile’s cell phone plans are fairly cheap all things considered. Verizon based plans with roadside assistance are available starting at $20/month for unlimited talk and text with 1 GB of data. There’s even an unlimited LTE data plan available with roadside assistance on the Sprint network for $45/month. ROK Mobile’s unlimited LTE data plan is actually tied as being the cheapest unlimited data plan on the market, although data speeds may be temporarily slowed during times of heavy network traffic once more than 20 GB is consumed in a month. That number is a little low compared to other unlimited data plan providers. 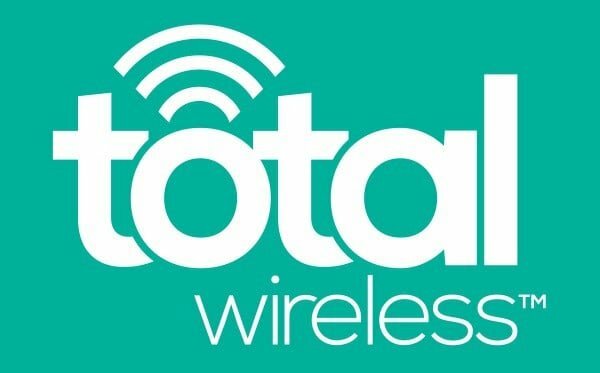 Total Wireless is a TracFone owned brand, and what lands the company onto this list is that they are the cheapest provider to offer at least 5 GB of data on Verizon’s network. For $35/month customers get unlimited talk and text with 5 GB of hard capped data. For an additional $10, 5 GB more data can be purchased at any time that rolls over from month to month as long as your account remains active. Unlike most other Verizon MVNO’s at the time of this writing, Total Wireless is one of the few providers to offer full speed LTE data access similar to what Verizon postpaid customers get. Those interested in Total Wireless can also consider fellow TracFone owned brand Net10 which through 11/26/17 will be offering a double the data for life promotion where subscribers can get 8 GB of data (instead of the usual 4 GB) that is not hard capped all on the Verizon network for just $36/month. TPO Mobile, (The People's Operator) offers its subscribers the ability to donate 10% of the cost of their phone plan to a charity of their choosing. 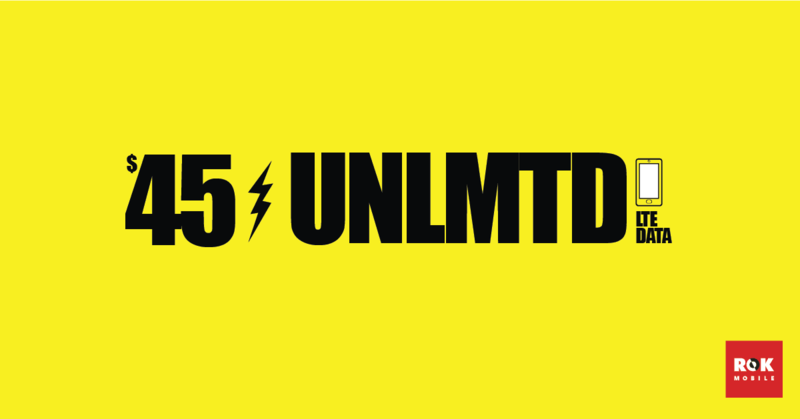 The T-Mobile and Sprint MVNO offers 6 cell phone plans that range in price from $10/month for 500 minutes, 500 texts and 250 MB of hard capped data to $45 for unlimited talk and text with 4 GB of data. In my opinion TPO Mobile's bread and butter plan is their Noble plan which costs $25/month for unlimited talk and text with 2 GB of data. The prices I have listed here are with an auto pay discount. Without auto-pay prices are $5 more per month. State taxes and fees may be added to the cost of their plans depending on where you live. Page Plus Cellular has been in the business a long time having been founded in 1993. In 2013 the company was acquired by America Movil and thus became another TracFone owned brand. As of this writing, what makes Page Plus Cellular unique is that they are currently the only Verizon MVNO to offer an unlimited LTE data plan. That plan includes unlimited talk and text as well as unlimited international text and a $10 international calling credit for $64.95/month with a $5 auto pay discount. Picking an MVNO last spot proved to be a bit difficult and so I settled with a tie. Red Pocket Mobile and Mint SIM both land on the list for the same reason, which is both providers give big discounts to subscribers who are willing to pay for more months of service up front. In the case of Mint SIM, the company offers plans that exclusively use T-Mobile's network. Subscribers can signup for service either 3, 6 or 12 months in advance and enjoy some of the best rates in the industry. Single month plans are not available, at least to new customers. One of Mint SIM's 12 month plans provides unlimited talk, text and data with the first 10 GB at high speeds for just $25/month. This is an industry best and you can see for yourself by comparing it to other phone plans in the cheapest plans list. Mint SIM does offer a 7 day money back guarantee to new customers to help alleviate any concerns you may have about joining the network. Like Mint SIM, Red Pocket Mobile also offers discounted cell phone plans to those willing to pay for more service in advance. However, unlike Mint SIM, Red Pocket Mobile's discounted phone plans are available exclusively through Amazon and eBay but not through the actual Red Pocket website. Additionally, unlike Mint SIM, Red Pocket's cell phone plans work on all 4 major networks in the USA providing talk, text, data and international talk on each and every network and international texting on the Sprint, AT&T and T-Mobile networks. Subscribers can opt to save on Red Pocket Mobile's base plan through an eBay offering, where for an average cost of $5/month you can get 100 minutes, 100 text messages and 500 MB of data. An Amazon exclusive plan is also available , that includes unlimited talk and text with 3 GB of data available on any network at an average cost of $21.25/month. At the time of this writing, this is the cheapest standard cell phone plan to offer that much data on either the AT&T or Verizon networks. As a bonus Red Pocket even offers its customers support in a multitude of languages which include English, Spanish, Chinese and Filipino. When considering Red Pocket or Mint SIM to be your provider, remember that this market is always changing. MVNO's do come and go and rates always change. Locking yourself into a one year deal may work out great for you, although if there are major industry price drops pending, the deals may not be as sweet as they once were before you signed. Yes, Total Wireless is pretty cheap. Perhaps in due time this list will be updated again. Total Wireless didn’t exist at the original time of publication (or at least didn’t offer LTE then). A word about FreedomPop though, if you’re connected to them by AT&T and thus their global SIM, they only offer 3G service. If you want 4G with FreedomPop you must connect with them via Sprint. Just wanted to add that Ting has awesome customer service. I’ve been with them for a couple years now and have been amazed again and again. I have never received such good customer service from any other business, OF ANY KIND, EVER. If you experience any issue, rest assured that they will solve it quickly, politely, and fully, and will probably credit you back any charges incurred along the way (even if it’s your fault!). And they have a great referral program. I wanted to love ROK Mobile… really. The first month was great. My credit card was charged for the second month, but their automated system neglected to update my account. So I found myself without no service (no data, no calls, no SMS) on a Sunday… the only day ROK Mobile does NOT offer customer service. I switched to Verizon Prepaid on Monday and haven’t looked back. (Virgin Mobile) Data Share Plan through Walmart gives you 300 minutes of talk time, unlimited texts, and 3G of data for $30.00 a month with great coverage, and decent phone selection. Haven’t had a problem yet. Virgin Mobile is a Sprint MVNO and I’m not sure that plan still exists but if so, it’s overpriced. Many companies are offering more than that for less than half the price. Freedom Pop blows. I’m still being charged the $10 a month for their “free service” even though I cancelled it 2 months ago. Don’t waste your time.